White is one of the most popular colours for the kitchen. Neutral, clean and suited to almost any home, there’s nothing more stylish than a crisp white cook space. However, if you want to give your classic white kitchen a fresh new look and inject some energy, it can easily be achieved with a pop of colour! 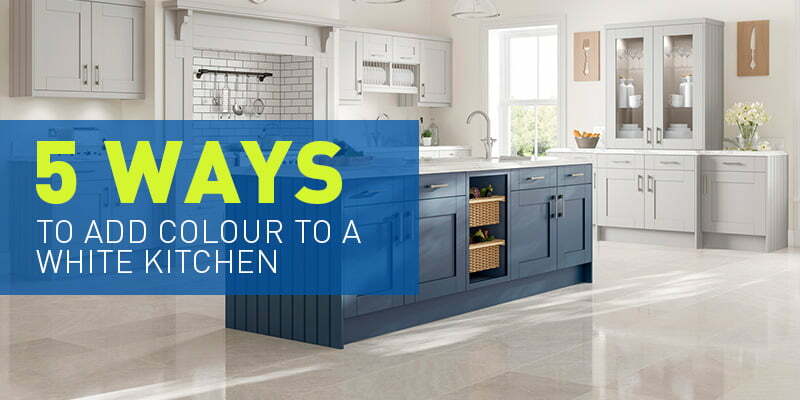 Here are our five top tips for adding colour in the kitchen. Having a hand painted kitchen island is a great way to introduce colour and brighten up your white space. At Direct Kitchens, our painted range can be customised to you, matching RAL Codes to your perfect shade. Inject colour into your kitchen with statement appliances. If you want to go bold, choose a vibrant colour for your oven or fridge-freezer, such as red or blue. If you want something more low-key, why not opt for a pastel shade for smaller, countertop appliances like the toaster and kettle. If you’re searching for a quick way to introduce colour in a white kitchen, make use of accessories. From stools for the breakfast bar to blinds and crockery on an open shelf, there’s a multitude of ways you can add a burst of colour with decoration. Complement your white kitchen with bold tiles that will contrast perfectly against neutral cabinets. Metro tiles are hugely popular in the kitchen right now and are available in a variety of colours to create a modern twist. Introduce the wow factor with a bright glass splashback above the oven. Or, if a splashback isn’t quite right for your space, simply paint a feature wall in one bold colour! At Direct Kitchens of Sheffield, our experienced designers can help you choose the right kitchen style for you. We can advise on tiles, splashbacks and appliances to help you liven up your space, and can even recommend accessories that would fit perfectly. If you’d like to speak to a designer, please give us a call on 0114 240 0158, or request a call back at a time to suit you here.